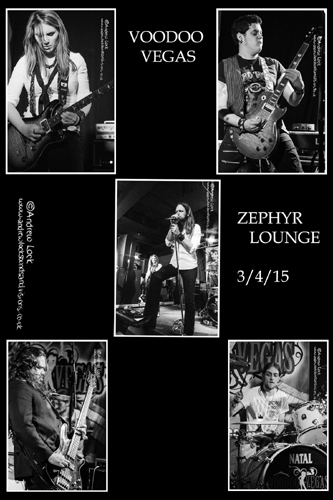 Voodoo Vegas made another welcome return to Leamington on April 3rd when they performed at the Zephyr Lounge. With a new guitarist in the line-up it was business as usual as the band rocked through a set combining material from their awesome debut album ‘The Rise of Jimmy Silver’ with new material hopefully destined for album number 2. Lawrence despite having difficulties with a nasty cold took charge at the front as always and the twin guitar sound as always with these guys to the fore. Most of my personal favourites made the set including ‘No More’, ‘Bullet’ and ‘Ferry Song’ and really impressed with newbie ‘Lady Divine’. Coventry rockers Black Star Bullet impressed with their support set full of power and song craft and their set also included a cracking AC/DC cover.